Windows Defender, the free security software that ships with Windows operating system, provides basic protection against malware and spyware. The enhanced version of Windows Defender in Windows 8 and Windows 8.1 includes almost all features of Microsoft Security Essentials and offers protection from viruses, malware and spyware. Users who prefer using third-party security solution like Kaspersky or Norton might want to completely remove or uninstall Windows Defender before proceeding to install third-party security software. 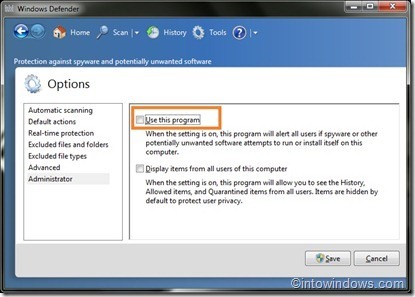 As you would know by now, Windows doesn’t allow you uninstall or remove Windows Defender with default settings but automatically turns off the Defender when you install a third-party security software. While it’s possible to manually turn off the Defender by disabling the same under Programs and Features or by turning off the Defender services, you can’t easily uninstall Defender from Windows OS. If for some reason, you would like to completely uninstall or remove Windows Defender from your Windows 7 PC, you can now use a free tool called Windows Defender Uninstaller. Windows Defender Uninstaller is the only tool around to help you completely remove or uninstall Windows Defender from your Windows 7 PC. Windows Defender Uninstaller not only deletes Windows Defender service and registry entries but also removes the Defender Control Panel entry. 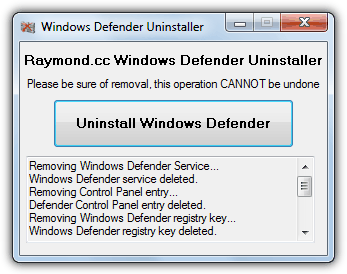 According to the developer, this initial version of Windows Defender Uninstaller works great on Windows 7 only. Future versions may include support for the enhanced version of Windows Defender in Windows 8 and Windows 8.1. We recommend you create a manual system restore point or system backup image before uninstalling the Defender, as it may not be possible to re-install the Defender. The developer of the program also recommends you disable the Defender before using this tool for the best result. Using this tool is extremely simple. Download the tool, double-click on the executable to run it and then click Uninstall Windows Defender to begin uninstalling Windows Defender from your PC. That’s it! Windows Defender Uninstaller is compatible with both 32-bit and 64-bit Windows 7. Thanks ian82@MDL for this tip. I used your Windows Defender Uninstaller on a 64 bit Win7 system and it seemed to kill Defender but did leave quite a few registry entries in the 64 bit section of the registry. As you warned, it is indeed not possible to re-install Windows Defender after this deletion. It is my belief that the MSI installer for the Defender software tool is internally inhibited to recognize a Win7 machine and declines to cooperate for no other reason than Microsoft management decision not to use a normal installer. what is next, uninstall windows ?